If you have an iPad, Kindle, or the Kindle app on any platform, for about $4 you can get valuable insight into parental alienation, and– more importantly– desperately needed solutions. 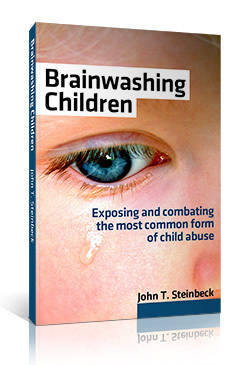 The eBook, Brainwashing Children, by this blog’s founder John Thomas Steinbeck, is not written by a child therapist or psychologist who has lots of theoretical knowledge about mental child abuse but has never experienced a campaign of hatred and contempt firsthand. Rather, it’s written by a Texas father who witnessed a deplorable assault on his relationship with his son. The books he read on Parental Alienation Syndrome by the experts were good, but weren’t enough. So he crafted his own methods and tools, and over the course of three years turned around his son’s relationship with him. Now he shares his insights and wisdom with anyone else whose is faced with an ex who’s tainting or denying a child’s love and affection. The book is a sad look into the reality of emotionally abusive parents. Click on the button below and order your copy of Brainwashing Children today. It’s also available on Amazon.com UK (visit here) and Amazon.com Germany (visit here) as well. Amazon Prime members? You can actually read the book for free (here’s how).